NEW build in PA !! i'm doing an 800sqft Saltwater IG and my contract includes choice of SGM River Rok or SGM Diamond Brite, so i'm looking for some opinions of either of these. I like the darker colors but i'm concerned about fading of those colors. 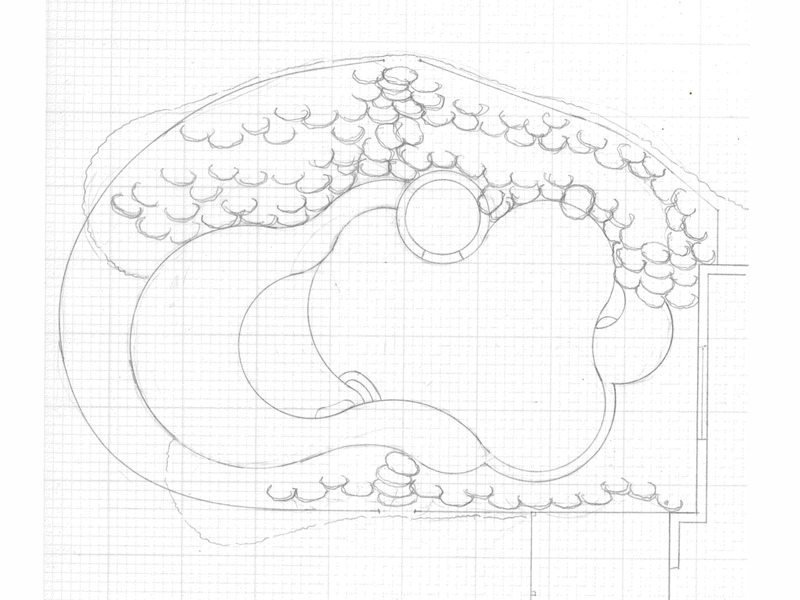 My pool is going into a pretty big hill so a lot will be done there with boulders to hold back the hill, but also will make for an easy waterfall coming down. My builder deals mostly with Jandy, so i'm pretty sure i'll be doing all Jandy equipment. Has anyone used their automation system iAqualink or iAqualink 2.0 ? I'm assuming its capable of controlling everything with the pool. I'm leaning towards stamped concrete. Is there any issue with that in my climate or with using a SWG ?? i'm open to pavers or stone if they have big advantages in my climate. What are your favorite 3 upgrades you've done to your pool that are unique and why? I'm sure there will be more questions along the way. thanks for any guidance and opinions you may provide ! What a pretty house and property! I can tell you have been reading LOL because of all of the pictures! THANKS! You are REALLY going to have to look at how to control water coming from the side and back of the property to the pool and house. I see some major deck drains going in. You will need quite a few returns to help move the water around those bends and curves. Do you have a design drawn up yet? Im hoping this is just some sort of speculation!!!! Im in the exact area as the OP and Ive not even considered a liner instead of concrete, but if I need to now is the time to know that. Can someone explain to me how a liner would perform better than concrete in a freeze/thaw area? Arent houses built on concrete in freeze thaw areas? A165fun- Im also interested in hearing about your plans around deck drains as I may need to copy a lot of what you do! I have never heard of this. We are in NH and have plenty of concrete pools here and they are only open from June-August because its cold the rest of the time. I am not sure where he got that info from. A few builders in our area only do concrete and are very reputable so I'm not concerned. Water flowing down that big hill is definitely an issue. I told the builder this is a major concern. He seems to be confident in handling it. I'll learn more about how they will do this as things move forward. I'll have the drawing from the builder to post shortly. 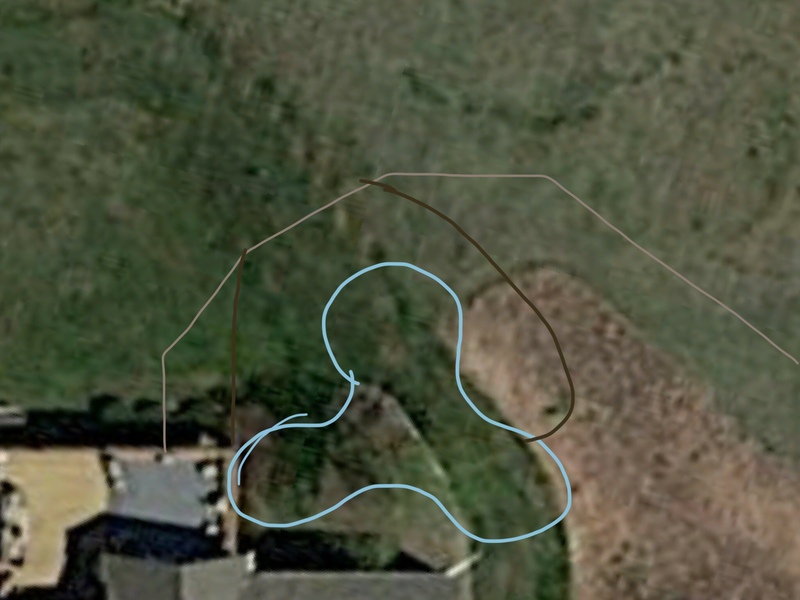 You're going to need to continue that drainage swale that comes around the corner of your house toward the pool location. It will have to be deep and wide enough to pick up surface flows coming off that hill as well. It will need to skirt the edge of the pool and drain towards the downhill side. 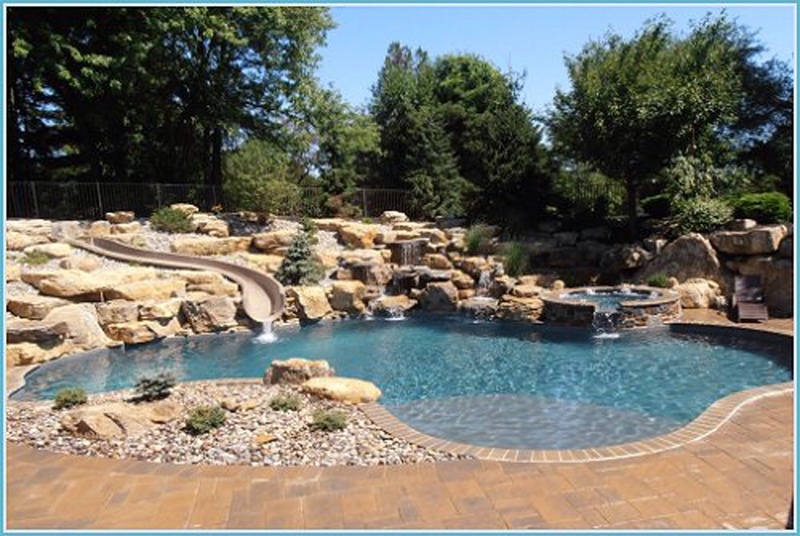 Your pool design has lots of perimeter feet vs usable area. Price is usually tied to perimeter feet so you're paying a premium in addition to all the grading you'll have to do. OOPS. 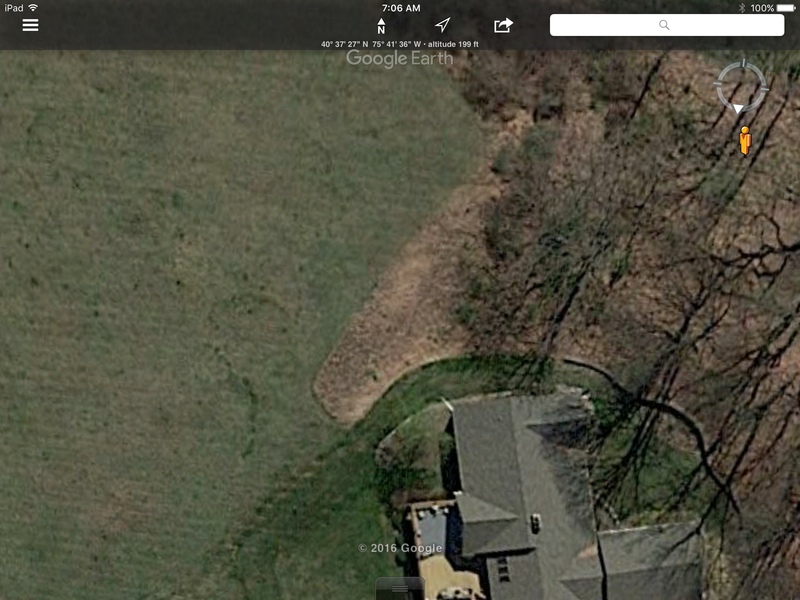 I just realized you're putting your pool right in the middle of that drainage swale. Probably not a good idea. Last year Temps here got down in the -20's. So it may be different my my part of the country. 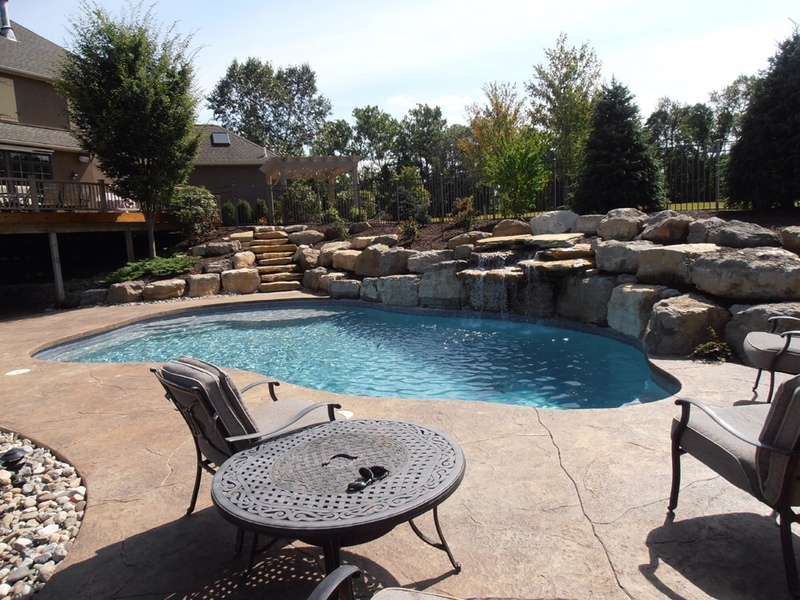 If you have a concrete pool, you have to drain it seasonally. Our city pool is concrete and that's what they do to avoid damage. Thanks for the input. I believe their strategy is to put 2 swails further up the hill so water doesn't run down that steep slope. And run drainage pipe under the surface to carry water from the back and side past the pool location. I would love to hear from others who built on a hill. We built on a slope. Reading through our build thread (link in my signature) will let you know how it was handled. Sounds like your PB has the drainage issue at the forefront and is addressing it on the large scale I would expect for this particular project. We already used up our limited flat space for a basketball court (unbelievably good investment given the hours of use over the years - and multipurpose nature of the area). So I can relate to wanting or needing to build on a sloped area. Concrete pools get built in all locations of the US, though I do believe the % of liner pools increases as you go north. I believe that is in part because of the specialty trades involved and them not being as available, which leads to higher costs for concrete vs. vinyl. I've never heard discussions on here of draining northern pools for winter. I'm not discounting the practice but am not familiar with it. You're going to need some retaining walls. You can't cut a swale in a hillside. Look at the drop from the corner of your house to the timbers around your patio. That looks to be a three foot drop right there. You could put a catch basin up on the side of the house and pipe out to daylight, but the drainage and retaining wall spend is going to be half as much as you're spending on the pool. 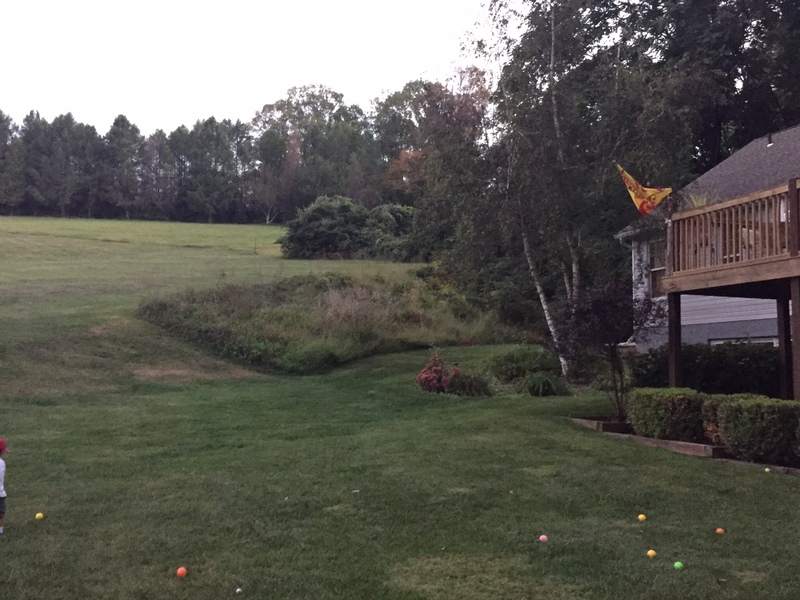 The most cost effective thing is to bench back into that hill (were the overgrown area is) and terrace (stair step) that embankment allowing the natural flows to continue AROUND your pool site. Catch basins and pipe aren't a cheap solution. 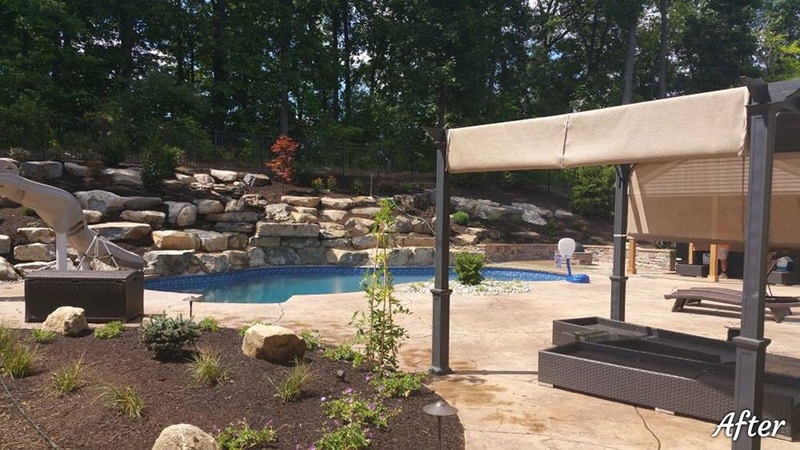 Our slope related expenses were roughly 30% of our pool/deck only costs (less the autocover). 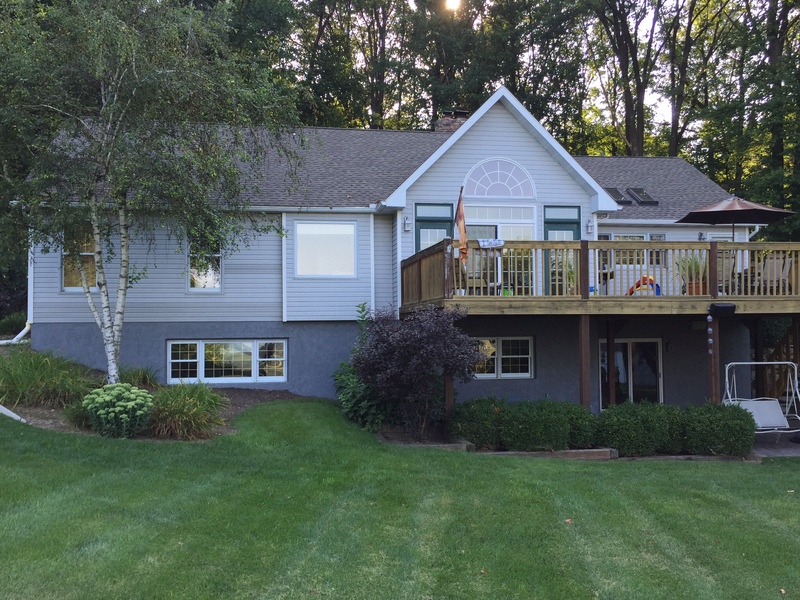 Wall and turned down concrete $18K; pool/deck costs less cover $63K. This work did not really include much grand water redirection. Mostly a retaining wall with proper stone and drainage behind it, and concrete decking turned down on the lower side of the pool because otherwise it would want to settle. Your totals could vary widely, but I'd expect 50% would be a 90th percentile number for those types of expenses. You lost me with some of the lingo there. But you're right, it's not cheap. Handling the hill, and all the boulder work is coming to about 35% of my total project cost. 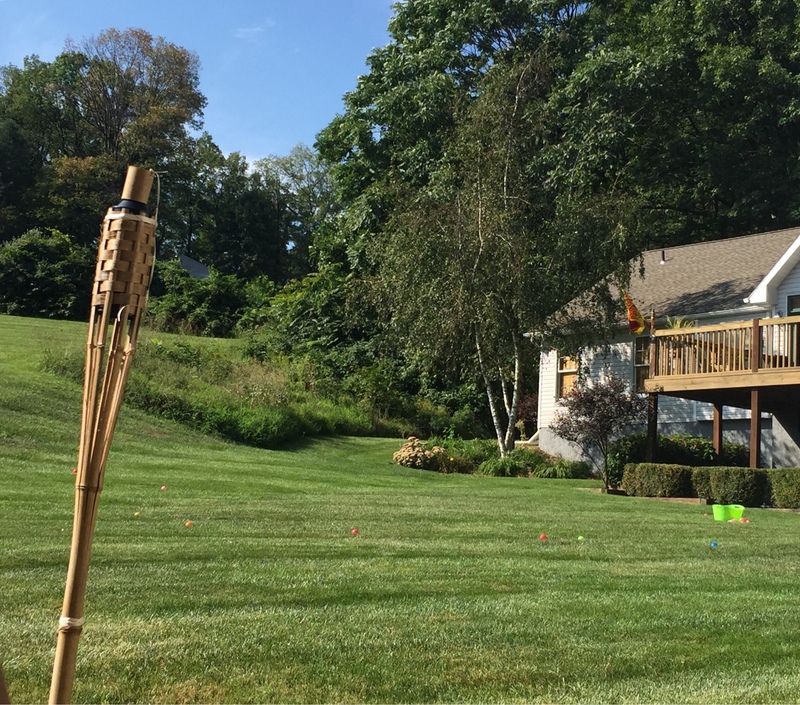 My builder has done these hill projects in the past (pics below). These are MUCH more dramatic than mine will be, but gives an idea of how the hill might play out....I HOPE! I am SO going to want to see this one happen! WOWER! This is going to be a fun build! Lets talk about a couple of things though. Jumping rock-check with your insurance to make sure it is okay just to be on the safe side please. Good idea! Definitely gotta check with insurance! I was thinking 7 or 7.5ft for deep end. I would go deeper but I was told the deeper I go, the more usable shallow end I'll lose. Do you think 7 or 7.5 is safe for jump rock? Obviously we would discourage anything head first.